stayed at resort for the 4th time, an would still recommend it. staff are very friendly, especially ana, resort has been re-furbished recently,and very clean, good location. the luxury accomadation is first class,very clean,very spacious,& quiet. everything from the booking of the holiday to the hotel staff were so freindly (gail uk contact, anna reception at resort. We have visited Flamingo suites five times now (the most recent for three weeks july and aug 2005) and the quality never ceases to impress. We think of the complex as a little oasis. Would recommend several local restraunts. Slow Boat, Harleys, Verdes and Cafe du Paris (in Las Americas).We did have an issue with some eastern european visitors (large group of 12 or so) as they wanted loud music around the pool area. This was however stopped by the onsite security. Will definitely return maybe later this year but definitely next summer. Saw these apartments advertised and thought we would try them out as they looked really nice. We were certainly not disappointed, we stayed in a 1 bedroomed apartment, it had a very large lounge leading onto a huge private terrace with private plungepool. There was a fully fitted seperate kitchen, & downstairs toilet. Upstairs was a large luxurious bedroom, with seperate dressing room and a huge bathroom complete with jacuzzi bath. The apartment had marble floors without, was tastefully decorated and had english tv. 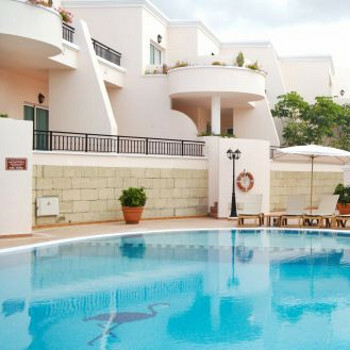 The complex has a very nice swimming pool with sunbeds around. I don't think there is any entertainment at the complex as there are only 24 suites. There is a pool table upstairs and there is a free coffee machine in reception. The apartments are obviously more expensive than average, but are much superior to anything we have ever stayed in in Tenerife. Some of the suites are cheaper as they do not have a private plunge pool and may be smaller. I would definately recommend this complex if you are not bothered about entertainment (plenty within walking distance anyway), and you just want a relaxing holiday in the sun. We will be returning early next year.